If you're still struggling to drive traffic in 2016 I have a simple but effective strategy I stumbled upon this year that might help you. You can use this strategy to drive video traffic to your CPA offers, affiliate links or to build a list WITHOUT having to even upload a video. Find expired domains in the descriptions of YT videos, qualify if the videos are getting daily views and redirect the clicks that the domain gets to your own online properties (preferably a landing page). Here's how to do this (with an example of what would make a potentially good domain acquisition). Step 1/3: Type In A Keyword To Find A Video In Your Niche. Best keywords you can target in any niche are keywords with buyer intent. Example: KDL 55W950B which happens to be the model number of a high definition TV would be a "buyer keyword" for someone looking to learn more about this type of television. If you're seeing daily view stats like the image above, then this would be a potentially good domain to acquire to redirect to your own amazon affiliate link or review site. We then need to check if the the domain has expired in Step 3/3 below. 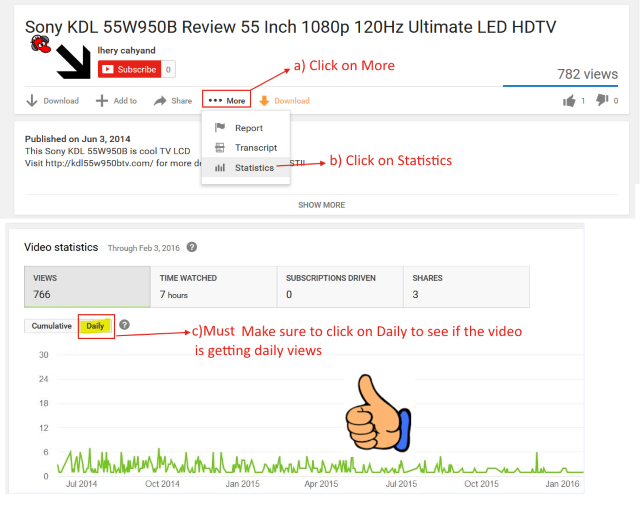 If you're not seeing any traffic shown in the statistics (or the video uploader decided not to show them) then restart the process from Step 1/3. Step 3/3: Find Out If The Domain Listed In The Video Description Has Expired. The next step involves clicking on the link in the video description to see if you get an error. If you do get an error then there is a good chance that the domain has expired especially if the video is an old one. 1) Always make sure the domains that you're going to be purchasing have daily views. See Step 2/3. The cumulative statistics don't reveal the complete picture. 2) Ask yourself if you would click on the link in the video description after watching the video? e.g. Did it provide value, have some form of call to action etc. Hope to share more of these traffic hacks with you all in 2016 but I hope this one serves you well. That's a really good idea! Never even thought about that. Very cool idea! Much appreciated! Hey man! Thank you for this great idea! How you came up with this idea?? And it is the reason, why I like warriorforum! You can find so many useful things here! Glad to share. Been using this strategy for some time now.